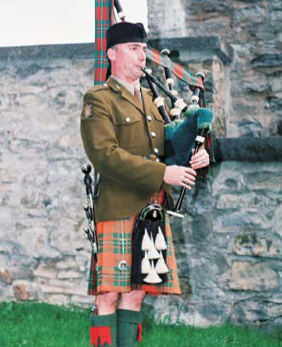 For generations, the music of the highland bagpipe has been an integral part of Scottish weddings, even in some of the farthest corners of the world where this remarkable race of people have established themselves. Mitchell McDowell has a variety of different uniforms, and he likes to provide the client with the opportunity to select the one that they themselves prefer. Such is the current popularity of all things Celtic that today's pipers are finding their services in demand not only from Scots or people who can claim a Scottish connection. 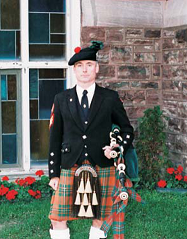 The sound of the highland bagpipe strikes a deep and resonating chord in all who hear it regardless of their ethnicity, and Scottish highland dress, with its multi-hued tartans and striking accoutrements, is undeniably eye catching. For these reasons people of Asian, Mediterranean and Middle Eastern cultures are increasingly requesting the presence of highland pipers at their weddings, receptions and other special events. When it comes to a public performance, every professional musician knows that careful preparation and meticulous attention to detail are the true keys to success. When the performance venue is a wedding celebration, preparation, punctuality, and flawless dress and deportment are absolutely critical, and it is at such a time that the benefits of hiring a professional become apparent. Whether his duties involve playing for the guests as they arrive at the church, piping the bride to the altar or the newlyweds back up the aisle to the applause of the congregation, or the grand entrance of the bride and groom into their reception hall, Mitchell McDowell offers the assurance that you are in competent, experienced hands. He understands that there is no such thing as just another wedding. Each is a truly momentous occasion, charged with emotion and high hopes for the future. Every couple views their wedding as a once-in-a-lifetime experience, and rightly so. With so much at stake, there is nothing to be gained by taking chances. Stick with the professionals... Professionals like Mitchell McDowell.